Take the good stuff. Leave the bad stuff. That’s the main idea behind buying a business via an asset purchase. There are innumerable ways to structure the purchase of a business, but most deals are either asset purchases or equity purchases. In an equity purchase, the buyer purchases the equity of the target company from its equity holders — stock in the case of a corporation and membership interests in the case of a limited liability company. The purchaser ends up with the entire company, along with all of its assets and all of its liabilities. In a deal structured as an asset purchase, on the other hand, the buyer purchases the company’s assets but leaves the corporate entity behind, along with some or all of the company’s liabilities. The key to this language is that the purchaser takes only the assets and leaves the liabilities behind. This is a great for the purchaser, but if the purchaser isn’t careful, it could end up with unwanted liabilities, regardless of what the purchase agreement says. A basic principle of property law is that a seller can’t transfer more rights to property than it holds. Thus, a seller can’t sell property free of liens if the property is encumbered. If, for example, the seller has granted a blanket security interest in all of its assets to secure a loan from a bank, the security interest remains in place after the business is transferred to the purchaser unless the bank releases its security interest. As a purchaser, you can protect yourself from unreleased liens. First, you should require the seller to agree in the purchase contract to transfer the purchased assets free of liens and encumbrances and negotiate a remedy in the event of a breach of that agreement. This contractual protection is essential, but the prudent buyer will go one step further and do what it can to ensure that there are no liens or encumbrances in the first place. 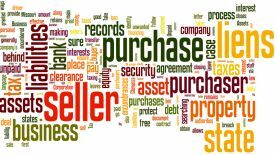 You can identify liens that currently encumber the purchased assets by searching public records. The main areas of concern are liens granted as security for debt, judgment liens, and tax liens. Security interests in personal property can be found by searching the state records. Prudent creditors record their security interests in personal property by filing UCC financing statements with the state. The process is very simple and is similar to a bank recording a mortgage in the land records when it loans money against real property. The purpose of these records is to provide notice to purchasers of the property that the property is encumbered by a lien. Judgment liens and tax liens can be found by searching relevant state and county records. While you can physically go to the place where these records are stored, there are companies that will do this for a reasonable fee. CT Corporation and Corporation Services Company are big players in this space and they do a good job, but I often use National Registered Agents, Inc. because it has great service in my area and saves my clients some money on fees. If your searches uncover liens, you should ensure that the debts that are secured by the liens are paid off and that the liens are released on or before the closing of the business purchase. Sometimes the seller will pay off the debts before the deal closes, but in the case of bank debt the seller generally needs the cash from the sale of its business to pay off the loan. In that case, you can obtain what is commonly known as a “payoff letter.” This is a document that states the exact amount of the debt and contains a commitment from the bank to release its lien when the debt is paid. Purchasers generally pay that amount directly to the bank rather than relying on the seller to pay off the bank. Unpaid state taxes are the seller’s problem because the seller retains all of its liabilities, right? Not so, according to state taxing authorities. In every state I’m aware of, there is a law that allows the state to assess the purchaser of a business for unpaid taxes. This is true even in the case of an asset sale where the purchase agreement provides that the seller retains these liabilities. If you receive an assessment from the state for unpaid taxes relating to a business you buy via an asset purchase, you’ll probably have a breach of contract claim against the seller, but you’re better off making sure this isn’t an issue in the first place. Most states have a process that allows buyers to protect themselves against unpaid taxes before the deal closes. The process and terminology vary from state to state, but the idea is that the state taxing authorities will provide a document certifying that the seller doesn’t owe taxes. In Missouri where my office is located, you can obtain a “tax clearance letter” by filling out a one-page Request for Tax Clearance form and sending it to the Missouri Department of Revenue. Obtaining tax clearance usually takes only a few days, although in some states a tax clearance request might trigger an audit of the selling company, which could delay things considerably. Not every state has a tax clearance procedure, however. In those states purchasers have to find other ways to protect themselves. Holding a portion of the purchase price in escrow until tax issues are cleared up and negotiating an off-set against seller financing obligations are effective, but crossing one’s fingers is also common. Structuring the purchase of a business as an asset purchase is an effective way to acquire the assets you want while leaving behind the seller’s liabilities. But be sure to avoid unwanted liabilities by making sure you identify all liens and have them released before closing, as well as making sure the seller doesn’t have unpaid state taxes. I’m looking at buying a property buying business and this advice has really helped. Not too sure it helps in UK law though, but good reading none the less. I must agree to this. When getting new investments, we must not take old stuffs with us or else it would just affect how we sort things with the new one. Leave all liabilities behind, and focus on new assets.